A little while ago (before Thanksgiving even), there was a really interesting exchange with the woman I share my office with (I'll call her Lucy). Lucy kept asking me if I'd seen another woman in our department (I'll call her Sally). I said no, I hadn't, and I was pretty sure Sally was out of the office for a week anyway. But Lucy kept asking, kept asking. On a Friday afternoon, we met with our other colleagues for a department meeting, and after, Lucy sent me a text message asking if I'd had a chance to talk to Sally yet. I said no, again, and wished her a nice weekend - I was headed to go get my son from daycare and go home. I was starting to get a bit irritated by this point. 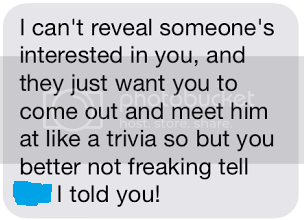 A few minutes later, she made just a quick comment: it's about someone who likes you. And immediately, I lost my maturity and composure. My mind immediately got dizzy, and not in a sweet or adorable way. More like panic, and anger. I don't like surprises to begin with; given the subject matter here, I was a mess. Lucy wouldn't tell me any details, saying she shouldn't have told me as much as she already had - because the guy is a friend of Sally's, and Sally had wanted to be the one to tell me. The laws in South Carolina are incredibly conservative. My husband moved a thousand miles away over eight months ago, but we can't get divorced until a full year has passed. So even though the relationship is completely over, it actually isn't over at all, from a legal standpoint. Not that I'd even have the time to anyway. And ... it's not just that I can't, but that even if I could, I don't want to. Even though I initiated the divorce, I'm still grieving. There are so many big feelings in all this. And ... I have enough of my own mess to sort out right now. It's not the right time to introduce someone else into the mix. And then, there's the part that stood out to me the most when she said it. I don't know Sally that well. When I ended up talking to her about him, I held back from some of the bigger questions - like, how did I come up in conversation? And ... why me? Because - and I don't know if this is well-founded or paranoia - but my immediate assumption is, he mentions liking bigger girls, and she mentions knowing one. The only attracting factor right now is a preference for my body type. I'm sure that there's someone out there who likes people for who they are and not just the shell that houses their mind and their soul. But in my experience, I haven't met men like that. I've met mostly jerks, and I've met a lot of ... chubby chasers. Guys who have a specific preference for big girls. And at least the way I've experienced it, it's not the same as liking a hair color or an accent. It's been predatory. I wasn't a person to love, I was a body that satisfied a fetish. And I was deeply hurt, and greatly taken advantage of, by guys with this preference. Was I at fault, for being naive? Were they at fault, for seeing the innocence and exploiting it? It's a tough situation with no easy answer. The resolution: I told Sally, you know, he seems nice, but I'm still married right now, and after the tumultuous last few years I've had, I'm not looking for anything right now other than my old self. She understood, and it hasn't been mentioned since. I'm proud of that. I'm proud of taking the time to fill in the cracks in my broken heart all by myself, instead of looking to food or to another man - the Band-aid solutions I have sought in the past. Omg, I am so stinkin' proud of you right now!! You go, girl!! Your maturity and independence astound me - I want to be just like you when I grow up, Mary (and I'm 51)! Good for you! I hear you with the chubby chasers. It never makes me feel good.